Discussion in 'Comics Central' started by Ome, Jul 1, 2017. The thought of all four shows coming together for one epic story is incredibly brave and exciting that I thought I needed to bring them together in their own thread. I know SUPERGIRL is on a completely different world from the other three shows, but I love how they managed to bring her in. I guess they were always planning to do something like this when they had the crossover with Barry Allen stumbling into Kara’s world. It’s a shame the other characters from that world couldn’t be a part of this story. Though should I really grumble when they’ve brought so many characters together? Barry bringing everyone together felt historic, but then I’ve never followed any comics so this could be a regular thing. Anyway, for me, it was one of those moments that I want to make that scene into wallpaper for my screen. I’m sure there will be a few of those floating around when I finish this story. I want to say I like how they’ve kept the story FLASHPOINT relevant to the story, but the way Cisco is acting is kinda ruining that for me. I hope it doesn’t linger too long during their epic time together and then what happens??? Diggle is angry at Barry for losing his daughter. I wish someone would have told Diggle that he didn’t have a son and therefore he shouldn’t be too harsh with Barry. How would he like it if someone said we could go back and put everything, but that would mean losing John Junior. Pitting the superheroes together in a battle was probably always on the cards, but that’s not why I want to see them all together, I want to see them battle with the real enemy. Not that I’m moaning too much, it was soon resolved when they figured it out. There’s been some funny moment during the introductions, especially from Rory who won’t call Kara Supergirl. How they put all this together is mind-blowing, trying to keep in with each show’s timeline and history all intact must have been both a nightmare and brilliant to work on. I also friggin’ love the logos all together at the beginning, God I’m on cloud nine right now. Shame on them for not sprucing up the logo this time. The Dominators have abducted a chunk of the team and Oliver is living a new life (in his head) where all his loved ones are back together. Seeing Laurel again made me realise how much I have missed her, sadly I didn’t get the same vibe with his mum & dad, but still it’s exciting to see them all share more scenes together. 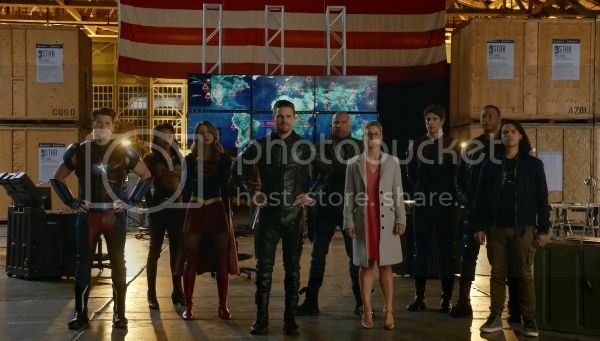 As much as I did enjoy the story with Oliver and his dead loved ones, I didn’t get much of a crossover like I did with THE FLASH episode, sure it was good to see the new recruits back and involved somehow, but it also felt more ARROW focused. That probably goes with the logo not living up to the previous FLASH episode. Once they were all back awake and realised they were on a spaceship we were back in crossover mode. I was impressed by how quickly the team managed to find a shuttle and work it to get off the main ship and then we got an amazing STAR TREK moment when they left the ship with hundreds of Dominator ships in pursuit. It’s moments like this that I want to last much longer, but with so much of the story to tell and the episode was coming to close I guess it was inevitable they would be saved, only to find themselves in another predicament. Cisco going crazy over Waverider was brill, even Felicity got to embrace the awesomeness. Oh, for Pete’s sake, just as Rory & co nabbed their alien, a host of agents come in and take over. And the reason these aliens are attacking is all down to Barry Allen. I like that twist, he’s obviously not really going anywhere, and that makes it interesting, in how he will get through this scenario. I also like that the aliens are not as hostile as originally thought, they just want to take Barry out of the equation and in their eyes for a good reason. AND FINALLY Cisco realises that he’s messed with time back in 1951 and this better mean only one thing – that he’s going to move on with Barry after acting like a tool for as long as I can remember. It’s going to end soon and I don’t want it to. This is still too good to be true, Felicity acknowledges Kara who walks past her, Felicity says to Roy that she feels like it’s looking into a mirror and then Ray says that Kara looks like his cousin – he was Superman once.. I can’t take any more I’m going to crash and burn in awesomeness. I loved the crossover and like you, especially loved seeing Oliver and Supergirl interact. It was interesting to see the Arrow characters involved in something much more sci-fi than they typically do on their show. I thought the Arrow portion of the crossover was the weakest link. Next you have the Supergirl/Flash musical episode crossover to look forward to. It was interesting to see the Arrow characters involved in something much more sci-fi than they typically do on their show. Yes, I loved that too. I also love how they bring light and humour to this darker show. What..? Wow..? I can't wait. I got distracted from Supergirl for a while while I was catching up on some other things but I finally caught up to where The Flash shows up to ask for her help. Then, on the off-chance, I Googled to see if the crossover was available on its own DVD - and it was! So I put Supergirl on hold again while I waited for the disc to arrive. Somewhat ironically, the cover has Supergirl front and centre even though hers is the only show not included. I had bit of trouble at first picking up the ongoing plot threads from the other shows but I know enough DC lore to figure out most of who's who and it all seemed to wrap up nicely in part three. 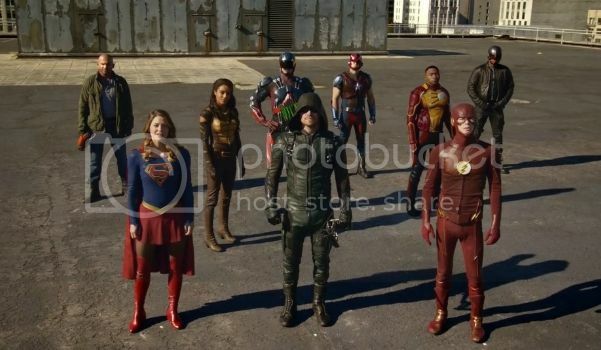 I didn’t get much of a crossover like I did with THE FLASH episode, sure it was good to see the new recruits back and involved somehow, but it also felt more ARROW focused. In the special features on the DVD they explain that it was also Arrow's 100th episode, which explains the Wonderful Life theme. Ray says that Kara looks like his cousin – he was Superman once.. I haven't followed any of the current seasons since they broke for Christmas, but reading this thread again is making me want to go back. I'm the same. I haven't been back to any of them since Christmas. I might go back to Arrow and finish that season this summer. Not sure about the rest.